I’m reprinting the poem that follows in celebration of the birthday of the great Japanese novelist & activist Makoto Oda (June 2, 1932 - July 30, 2007). In 2002 I was invited, along with many others, to celebrate his “koki” or 70th birthday, a traditional event in Japanese culture. He had been known to me as a tireless fighter for human rights & against all forms of cruelty & repression perpetrated in the service of nation & creed. 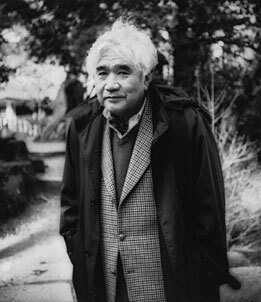 We met often & performed together on a number of occasions, & in 2004 he commissioned me to write a poem for a special issue of the magazine Subaru that he was editing as a commemoration of Japanese culpability in the Nanking massacre of 1937. My response appeared later in my own China Notes, published in Japan & Canada by Ahadada Books, but I want to post it here as well, along with a part of my birthday greeting from 2002 & from a later letter dated May 12, 2007, while he was still pursuing the cause of universal freedom (more specifically in this instance: a tribunal condemning autocratic repressions in the Philipines) after announcing his own impending death. It is a great pleasure to have you join us in this curious age into which Diane and I entered a few months ago. This makes us almost onaidoshi [ceremonial age-mates] – a word that Ito Hiromi just taught us – Diane born in 1932 like you, and I at the end of 1931. In the last ten years we have come to consider you among our true good friends. More than that we think of you as one of the poets who has put his writings and his language at the service of all who dream and work for peace and freedom in a world of wars and cruel repressions. I remember most vividly standing with you in a field in Vermont and reading poems in memory of the double holocausts of Auschwitz and Hiroshima. I embraced you then and will embrace you every time we meet. I received -- yesterday -- a packet of writings from Nara [Oda’s daughter], and once again I have to thank you for opening my eyes and ears to matters in the world of which I was hardly aware before this. Knowing about it now I will try, as far as I can, to inform others, in the hope that something may yet be done to bring these injustices to an end. (I have also checked out the tribunal proceedings on the internet and can make use of what I found there.) My comrade-in-arms Pierre Joris will get some of it onto his Nomadics blog and I will try to find some other openings as well. But you know of course that I'm writing you mostly in response to the other part of your letter. I had already heard something about it a few days ago, when Hiromi Ito told me that she had read it in one of the Japanese newspapers. Her report to us was only about your grave illness, not about your strong statement (once again) in the defense of human rights and against the tyranny of the powerful and privileged (and immeasurably cruel). Reading it now as a whole I felt again the great respect and even the love I've had for you, from as far back as our first meetings. I can accept with great sadness your assessment that your days are numbered while hoping that the numbers may be larger than what you indicate and that you'll be able to continue the work that you alone can do. Diane shares all of this with me and joins me in reaching out to you and to Sune and Nara as well. Your words give us courage, to believe that it is possible to live a good life down to the end -- "to stay well," as you write, and to do well "as long as we are alive."